1. Hezekiah FRITH, son of William FRITH ( -1771) and Sarah LEA (LEE) ( - ), was born in 1763. 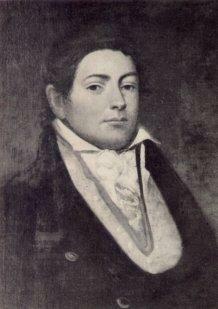 He died in 1848 in Bermuda. Bermuda's "foremost privateer". He had several wives. A book has been written about him by Sister Jean de Chantal Kennedy. He hoarded booty from two stolen ships, kidnapped a young French woman, hid her from his wife - and stashed his wealth for his family to start a liquor store. She and Frith haunt Inland Water (the home that he built for himself). In the 1920s it was rented by the dramatist Eugene O'Neill who lived here in alcoholic oblivion with his beloved Finn MacCool (eventually shot to death by a neighbor) and from 1956 by Sir Noel Coward. A snippet from the life of the notorious pirate: "The brig "Hezekiah", master Hezekiah Frith, did not arrive in Bermuda as expected c 1797. He and the brig were captured by the Spaniards, frigate "Juno". On release and return he published in the Gazette (Sep 2 1797): "I beg you will insert the following particulars in your Gazette, of my capture, and the treatment me and my crew received from the Spaniards in the Havannah, viz; I was taken the 5th of April last in the Gulf of Florida by the Spanish frigate "Juno" and on the 8th arrived at the Havannah with the brigs in company. I was treated on board the frigate as well as I could expect from what I had always heard of the Spaniards but my officers and men were treated badly on board the frigate. As soon as we came to anchor under Morro Castle the boats came on board and took all the prisoners off the frigate except myself and Captain Cluness of the privateer ship "Hundoston" of Jamaica which she took also three days before me. The captain of the frigate told us we should remain on board the frigate until he went to sea and he said we should be better treated than on board the prison ship or on the shore at the fort, as we, to our sorrow, soon after experienced, for, as soon as the frigate sailed we were put on board the prison ship of 80 guns in the lower gun deck, in a most filthy place more fit for a hog style then to put up Christians in, with a daily allowance of three wormy cakes of bread and three fourths of a pound of raw beef per man, which we could not get dressed unless by hiring anyone to cook it... Had it not been for the kind asistance of some masters of vessels in the harbour then in the Havannah our situation must have been more wretched if possible particularly Captain John Brownlow and Captain Christopher Lusher who both came on board and brought everything we wanted to eat and drink... " ". Advertisement: "Samuel Hurst has imported in the Brig Hezekiah, Capt Frith, from London, a fashionable assortment of cloths and cashmeres, .. with what goods he imported by Captain Newbould.. (Bermuda Gazette, Jul 25 1795). The brig "Hezekiah", master Hezekiah Frith, did not arrive in Bermuda as expected c 1797. He and the brig were captured by the Spaniards, frigate "Juno". On release and return he published in the Gazette (Sep 2 1797): "I beg you will insert the following particulars in your Gazette, of my capture, and the treatment me and my crew received from the Spaniards in the Havannah, viz; I was taken the 5th of April last in the Gulf of Florida by the Spanish frigate "Juno" and on the 8th arrived at the Havannah with the brigs in company. I was treated on board the frigate as well as I could expect from what I had always heard of the Spaniards but my officers and men were treated badly on board the frigate. As soon as we came to anchor under Morro Castle the boats came on board and took all the prisoners off the frigate except myself and Captain Cluness of the privateer ship "Hundoston" of Jamaica which she took also three days before me. The captain of the frigate told us we should remain on board the frigate until he went to sea and he said we should be better treated than on board the prison ship or on the shore at the fort, as we, to our sorrow, soon after experienced, for, as soon as the frigate sailed we were put on board the prison ship of 80 guns in the lower gun deck, in a most filthy place more fit for a hog style then to put up Christians in, with a daily allowance of three wormy cakes of bread and three fourths of a pound of raw beef per man, which we could not get dressed unless by hiring anyone to cook it... Had it not been for the kind asistance of some masters of vessels in the harbour then in the Havannah our situation must have been more wretched if possible particularly Captain John Brownlow and Captain Christopher Lusher who both came on board and brought everything we wanted to eat and drink... " (Bermuda Hist Quarterly, Vol XVII, no 2). The privateer "Experiment", owners Hezekiah Frith and Daniel Tucker took a prize the "Bellona". Frith in 1809 sued Tucker, his partner over the spoils of the ship. Benjamin Dickinson Harvey defended Tucker and Francis Forbes was solicitor for Frith, who won the case. She was the first Bermuda ship to be advertised as having a copper bottom, built for Bridger Goodrich, and carrying fourteen or sixteen guns , launched from Messrs. Brown and McCallan's shipyards Oct 1793 as a privateer against the French. (Bermuda Hist Quarterly, Vol XVI, no 4). For sale- "one hogshead rum by Messrs Jennings, Tucker & Co per Schooner Experiment, John Nash, master, for a cruize. (Bermuda Gazette, Sat 18 April 1795). In 1797, Daniel Tucker, Hezekiah Frith and the three Wood brothers purchased the schooner "Experiment", followed the next year by another ship of the same name. An "Experiment", first owned by Bridger Goodrich and then by brother Edward was lost c 1797 to privateering. (Bermuda Hist Quarterly, Vol XVII, no 2). The 3 Wood brothers may be Joseph, Stowe, & Richard. c 1790 Hezekiah Frith's sloop "Fanny and Betsy" was one of the most successful privateers afloat, and when she was taken by the French, he built the "Experiment" (see above). She was lost 1798. (Bermuda Hist Quarterly, Vol XVI, no 4). under Hezekiah Frith also made joint cruises with Royal Navy vessels and was attached to a navy squadron for a month.This sort of co-operation was not as uncommon as many historians have assumed, and largely explored evidence suggests that the Royal Navy often used privateers as tenders and scouts and it was far from unheard of for navy officers to take a spell at privateering between naval commands Relations with Militia Units. Privateers make a strong case to be considered as a seagoing militia, a community controlled military force that answered to local needs and one that was at least as effective as the Sea Fencible reserve units being created at the same time in Britain. This function is strongly supported by the many links between the Queens County militia regiment and its privateer companies. There was a noticeable parallel between leadership of the Queens County militia and the Liverpool privateers.